Paris, France (BBN)-Paris’s first car-free day has been hailed a huge success after monitors recorded a 40 per cent drop in air pollution and a 50 per cent drop in noise pollution in some parts of the city. 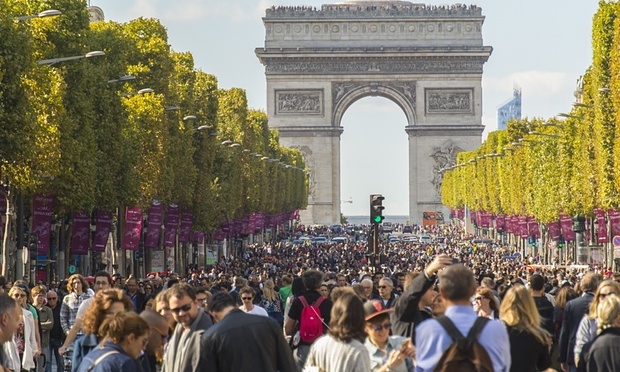 The car-free day took place last Sunday and, while it only affected one third of the French capital, led to a significant drop in levels of nitrogen dioxide, reports The Telegraph. The results, recorded by independent monitoring organisations Airparif and Bruitparif, were so resounding that the mayor of Paris is planning more car-free days for the capital, the Guardian reports. Mayor Anne Hidalgo said the city’s pollution levels were worrying and must be addressed. “We might envisage days without cars more often … perhaps even once a month,” she wrote on Twitter. Earlier this year a spike in smog levels briefly made Paris the world’s most polluted city. Traffic in the city is notoriously bad, with cars stuck in long jams belching out high levels of nitrogen dioxide that regularly breach regulations.